Family, friends and coworkers recently came together to celebrate a benchmark anniversary for one of NOVA’s finest, Bob Wilson. Bob has played a key role in NOVA’s early success and growth as he was one of the very first field professionals we hired back in 1996. In fact, many clients awarded NOVA projects over the years just because Bob was committed to the project. 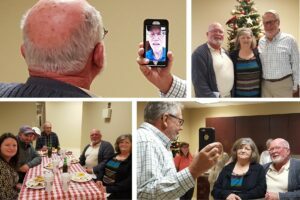 Walter Cook, one of NOVA’s founders, couldn’t make this special event, but thanks to facetime we he was able to join the party! Thank you for the last two decades, Bob!